The opposite side of the canister printed in black with a version of the The Shepherd pattern. 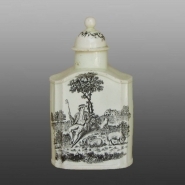 A creamware tea canister with cover printed in black with the Tea Party pattern. This genre pattern was one of the most popular designs to have been used on late 18th century printed English ceramics, in particular on tea wares. 18th century examples of this pattern printed on porcelain from designs by Robert Hancock and later 19th century Tea Party patterns printed underglaze are also included in this exhibit.